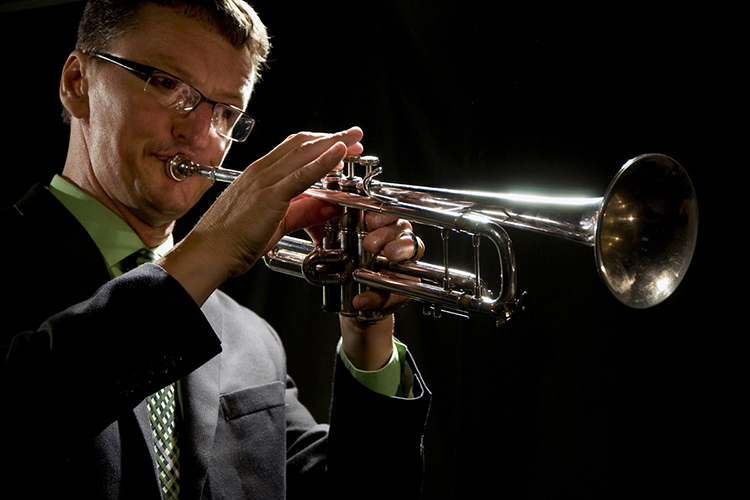 MTSU music faculty member, trumpeter and composer Jamey Simmons will perform and lead the professional jazz ensemble known as the Tennessee Jazz Collective at 7:30 p.m. Thursday, Feb. 14, in Hinton Music Hall of the Wright Music building on the MTSU campus. This will be the second concert of four in the annual series known as the MTSU Jazz Artist Series. “The concert will showcase new arrangements and compositions played by guest musicians as well as our student and faculty artists,” said Simmons. MTSU faculty who will perform with the group are Don Aliquo (saxophone), Matt Endahl (piano), Chip Henderson (guitar), Ashley Kimbrough (voice), Rick Mraz (saxophone), Brian Mueller (vibes), Mike Parkinson (trumpet), Derrek Phillips (drums), and Jonathan Wires (bass). Area freelancers and students will augment the ensemble to create a full jazz ensemble. Tickets for the Feb. 14 concert are $10 general admission and free for MTSU students, faculty and staff with proper ID. Discounts for area band students and educators are also available. To reserve tickets call 615-898-2724 or email James.Simmons@mtsu.edu. For more information about the MTSU Jazz Artist Series, please visit www.mtsu.edu/music/jazzseries.php. For further information on this and other concerts in the MTSU School of Music, please visit the “Events Calendar” link at mtsumusic.com. For more information about the Tennessee Jazz Collective and Jamey Simmons, visit www.jameysimmons.com/.